As a result of Manifest Destiny, the United States would expand from 13 Colonies to an empire spanning from sea to shining sea in merely 72 years, forcing global powers to recognize the nation across the ocean. The rapid expansion of the nation caused as many problems as it did answers. 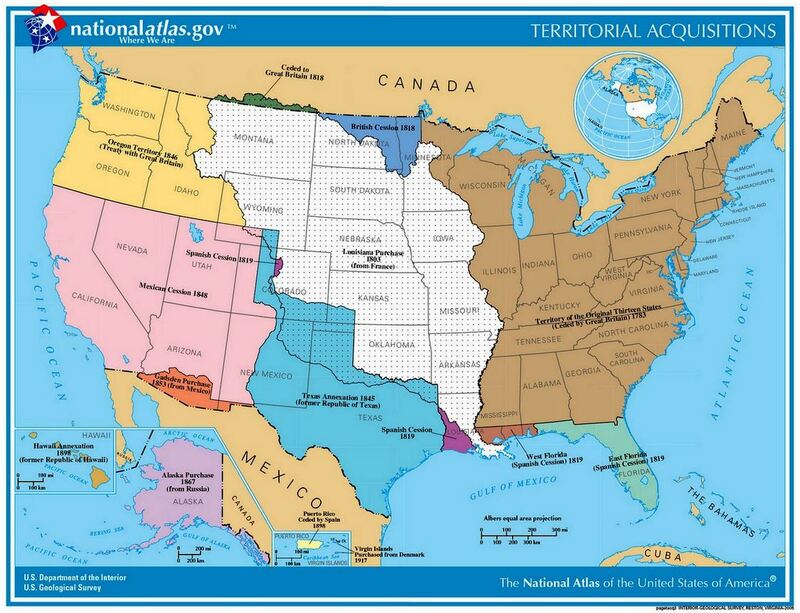 While President James K. Polk publicly declared that it was the destiny of the United States to occupy all of North America, privately he stated that it included much of the sovereign nation of Mexico. President Andrew Jackson had believed that Native Americans had to move west in order to make more room for the whites. During the Civil War, Southerners viewed the Union Army's invasion of the South as the implementation of Manifest Destiny and a centralized government bent on absolute dictatorship. As Mexico was forced to relinquish all of California, gold was literally discovered the very next week, making many speculators, known as 49ers, millionaires in a short time. Manifest Destiny was a phrase used by leaders and politicians in the 1840s to explain continental expansion by the United States – revitalized a sense of "mission" or national destiny for Americans. Manifest Destiny was also discussed during the Kansas-Nebraska Act. Manifest Destiny served to justify the Mexican-American War and preamble to the destruction of the American Indian. The United States believed its mission was to extend the "boundaries of freedom" to others by imparting its idealism and belief in democratic institutions to those who were capable of self-government. It "excluded those people who were perceived as being incapable of self-government," such as Native American people and those of non-European origin. But there were additional forces and political agendas at work. As the population of the original 13 Colonies grew and the U.S. economy developed, the desire and attempts to expand into new land increased. For many colonists, land represented potential income, wealth, self-sufficiency and freedom. Expansion into the western frontiers offered opportunities for self-advancement. Manifest Destiny Map for Kids. Manifest Destiny. To understand Manifest Destiny, it's important to understand the United States' need, desire and justification to expand. While the following points illustrate some of the economic, social and political pressures promoting U.S. expansion, it also shows that the acquired territory came at a high price resulting in negative consequences for many. Native Americans were nearly eradicated from the land that they once called home. Forced onto lands that Washington believed were far enough west and too barren for any white man to ever desire, the reservations would soon be overrun as white settlers partook in the Homestead Act and the promise of newfound dreams in an American oasis. Mexico lost 55% of its territory to the United States under the doctrine of Manifest Destiny, thus forcing the defeated nation into bankruptcy and causing its economy to be in shambles for nearly 100 years. American Civil War was a harsh reality of Manifest Destiny, because with the Mexican Cession in 1848, the Compromise of 1850 followed, only to fail as four free states were carved quickly from newly acquired territory causing Sectionalism and a more politically powerful North and an economically weaker South. At each step—from John Tyler's attempt to annex Texas in 1844, to the Kansas-Nebraska Act, to the opening shots of the Civil War—the issue of slavery had to be confronted. Morrison shows that the Revolution was the common prism through which northerners and southerners viewed these events and that the factor that ultimately made consensus impossible was slavery itself. By 1861, no nationally accepted solution to the dilemma of slavery in the territories had emerged, no political party existed as a national entity, and politicians from both North and South had come to believe that those on the other side had subverted the American political tradition.